Making positive connections with students outside of the typical school day is one of the most important things a teacher can do. At the beginning of the year, I take the time to send two sets of notes to my kiddos. The idea to send these first notes came from one of my teammates. This is something she's been doing for several years and I just had to join! These notes are for last year's kiddos who are now going into third grade. The transition from 2nd to 3rd is a bit more challenging and the expectations are much higher. 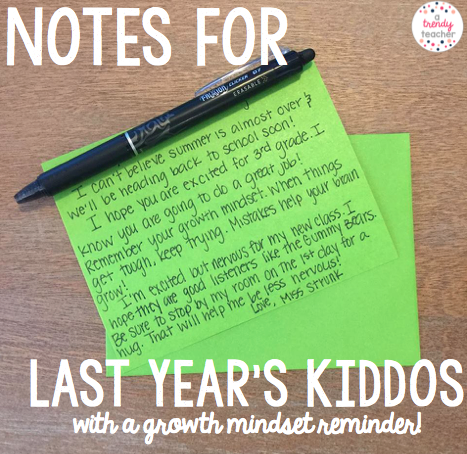 Reminding students of the growth mindset lessons we did last school year helps them to remember it's okay to make mistakes and to keep on trying when things get tough. The book, Your Fantastic Elastic Brain lends itself well to this idea. This was one of my favorite class meeting lessons. I also think it's great to remind the students that teachers get nervous on the first day too! This helps them understand they're not the only ones who are a little iffy on the first day back. And the best part, you get to see all of their sweet faces as they come visit you now from their new "big kid" classrooms. 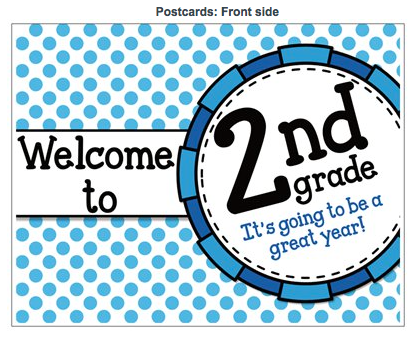 I also ordered "Welcome Back" postcards for my new class from Vista Print. 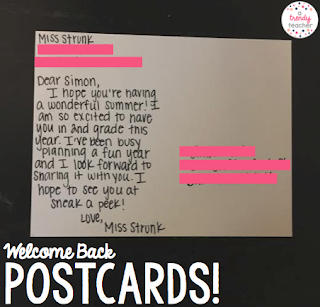 I took some time to hand write each note to my new kiddos and I mailed them off before our "Sneak a Peek" night. I think it's really important to make personal contact with each and every kiddo before the first day of school. I have always been super impressed with Vista Print and again they blew me away. I order 100 postcards for $10.00! What I really liked about using Vista Print was that I could upload my own image for the front of my postcards. Check out the front of my postcards. You can grab the image to use for your own postcards by clicking here. I Believe In My "Selfie"